Archaeologists have uncovered a new site in Petra, Jordan, using Google Earth and drones -- a massive site, about the size of an Olympic swimming pool, believed to have been created by the Nabateans between c. 100BC to 100AD -- about one mile outside of the city. The platform is believed to have been used for ceremonial purposes, though its specific purpose has yet to be uncovered. The researchers involved say the site was hardly hidden, but it took satellite imagery to help them discover it. 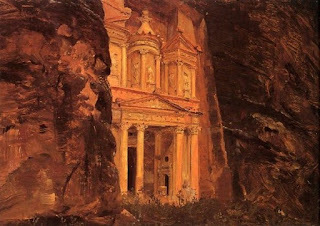 It does not appear that any platforms similar to it exist within, or just outside of (as this one), the ancient city of Petra. Petra was once a great commerce and trade center which certainly housed many temples to numerous religions, and remains the single most important societal contribution of the ancient Arabic Nabateans.